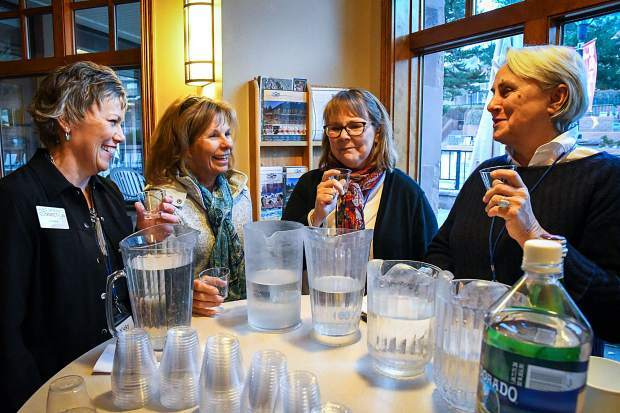 Board President of the Balneology Association of North America Janet Abbott (far right) explains the taste and mineral difference in the waters from multiple different springs located in Manitou Springs at the start of the Hot Springs Connection Conference at the Glenwood Hot Springs Pool on Wednesday evening. The first-ever national conference of hot springs professionals began in Glenwood Springs Wednesday, with organizers hoping to find better ways promote the natural destinations. More than 90 people from 14 different states will attend the conference, indicating the high level of interest for collaboration among hot springs operators. Vicky Nash, CEO of tourism communications firm Resort Trends, Inc., said the idea came after the success of the Colorado Historic Hot Springs Loop, an association of visitor bureaus in Glenwood Springs, Chaffee County, Pagosa Springs, Ouray County and Steamboat Springs founded in 2016. The five regions receive matching grants from the Colorado Tourism Office and collaborate on certain marketing initiatives. Nash and her team sent out surveys asking the managers of 215 natural hot spring sites whether they’d be interested in some kind of national trade association. The 65 responses Nash received in return were overwhelmingly positive. A conference was the best way to start the process, but Nash isn’t sure what kind of association will work best for the industry. “We definitely want to form some kind of association, maybe not in the traditional sense,” Nash said. She would like to see a way for hot springs operators and owners to collaborate, and thinks there should be a website with a comprehensive map of hot springs resorts in the U.S.
Based on the excitement for the conference, Nash says that it should continue for years to come. “Everyone is already assuming it’s going to be an annual conference,” Nash said. “We need this kind of group in our industry because it’s a great way to exchange ideas, and help promote good values of hot springs, ” Steve Beckley, co-owner of Iron Mountain Hot Springs, told the Post Independent. Beckley and Mogli Cooper, another co-owner of Iron Mountain, will be presenting to the conference Thursday on their experience building the new resort. Beckley said he hopes the group will be able to form a national trade organization to share tools and tips and collaborate on promoting the industries. The conference will feature tours of the three main natural springs and vapor attractions in Glenwood Springs, speakers from around the world, networking opportunities and a meeting of Colorado delegates to the conference. The event and fledgling organization is intended for operators and owners of hot springs, and Nash hopes the conference will provide ideas for specific challenges like the right kind of pumps to install in pools to the latest practices for restoring aging hot springs infrastructure. The seminar topics include water rights issues related to hot springs, water quality and sanitation, presentations from those who have built or restored new pools, and a special presentation on the history of the Glenwood hot springs from Bill Kight, executive director of the Glenwood Springs Historical Society. “We tried to cover the whole spectrum, from health and wellness and spiritual components of geothermal waters, all the way through operational matters,” Nash said.